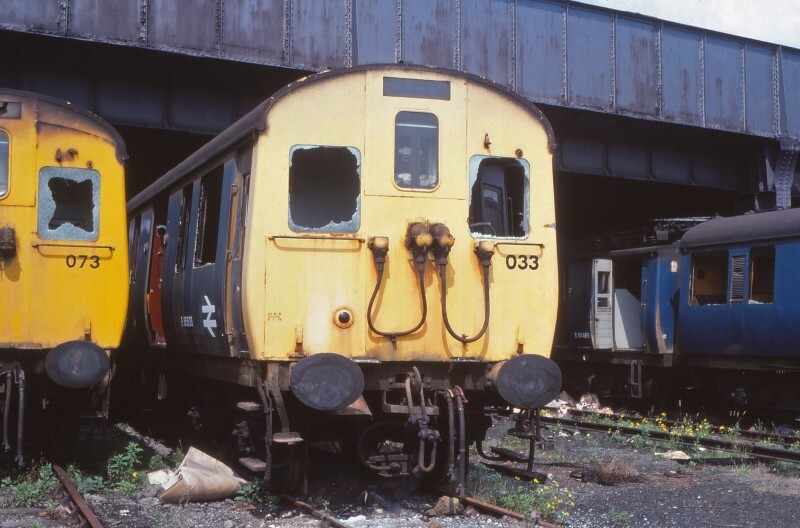 Martyn Hilbert's Railway Photography - BR Blues - Withdrawn Class 306 EMUs at Vic Berrys, Leicester. Withdrawn Class 306 EMUs at Vic Berrys, Leicester. Withdrawn Class 306 Liverpool Street - Shenfield electric multiple units, 073, 033 & 066 take refuge under the substantial girder bridge that took Upperton Road in Leicester over the former Great Central Main Line at this once busy location. Dating from 1949 the vintage units were awaiting the call to the adjacent scrapyard operated by Vic Berry on July 19th 1982. The well-worn units had been made redundant by newly built class 315 EMUs from BREL York.